I’ve just spent 28 days living in New York City to live out a dream and see what I think. Well, it’s been quite an experience. The guy who invited me to fly out and spend a month living here has been unavailable for the past two weeks so that has left me to truly experience NYC as if I lived here on my own. After taking a little getting used to being here, I have settled into it nicely and have really been having an enjoyable time. I took two trips to Fire Island and spent the Memorial Day weekend here on my own. Since I’ve been here I’ve had lunch with a former client, spent time with a couple of friends I haven’t seen in a few years, sat in the 10th row of the orchestra section at the broadway musical “Book of Mormon”, visited the World Trade Center memorial site, did some shopping, worked out regularly at Crunch gym, and made a number of wonderful new friends. I’ve also been exploring the job market here as well and have gotten a number of nice leads. My coaching business has even seen an increase in calls from the NYC area for consultations. When I first made plans to spend a month in New York, I began by looking for an apartment to sublet. Unfortunately, I wasn’t able to find just one place to stay continuously for 30 days and would have to change places a couple of times. But then it occurred to me that although it’s a little more expensive, Oakwood Worldwide provides furnished corporate housing with a minimum 30 day stay, and I’ve used them several times in the past. So I called them up and they had me setup to stay on the 46th Floor of the Silver Towers luxury apartment building in Hell’s Kitchen the very next day! Wow, has it been worth it! 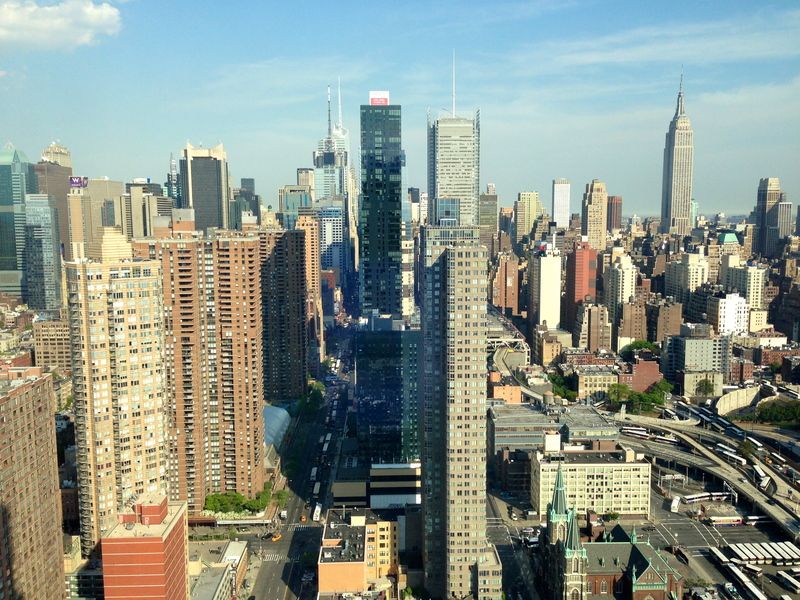 I’ve loved staying here and check out my view of Times Square and the Empire State Building! Right now I have 13 days left here in Manhattan and I hope they don’t fly by too quickly. I feel like I’ve been getting a really great experience feeling what it’s like to truly live here and it’s been amazing. I can definitely see myself living here at some point and if an opportunity came up now to stay here long term I would take it. But I do love the West Coast too. NYC is fast-paced, intense, and always on. It can be a bit exhausting and if I were to live here full-time, I would have to get away to relax on a regular basis. On the West Coast, life feels much more laid back and easy going. The weather is always great in California where I’ve been spending most of the past three years. Seattle is gorgeous, wonderful, and I believe it will always be my home base. I love it there but I want to explore the world too. All in all, living in NYC has been an experience of a lifetime and a dream come true. It’s all part of me living The Amazing Life Project.